Enjoy the Holidays and Join Us Next Summer; Happy New Year; Caroling at Cloud Gate; Holiday Shopping; Peppermint Coco. Plan Early for Next Summer's Event; Group Tours; A Standing Ovation for Maestro Muti; Cemetery Tours; Heaven on Seven Chicken and Sausage Gumbo. The Golden Era of Yachting; Group Outings; Did You Know? ; Celebrating 10 Years of Broadway in Chicago; Our Signature Bloody Mary. 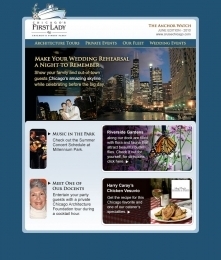 Make Your Wedding Rehearsal a Night to Remember; Music in the Park; Meet One of Our Docents; Riverside Gardens; Harry Caray's Chicken Vesuvio. 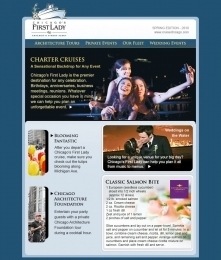 Charter Cruises; Blooming Fantastic; Chicago Architecture Foundation; Weddings on the Water; Classic Salmon Bite.